Working with us to insure your mobile home is a calm, reassuring, and easygoing experience — especially when the weather isn't. Our agents are hometown people delivering honest answers, good advice, and quality customer service from within your community. We have adjusters throughout Kentucky. When you file a claim, you can expect it to be handled quickly and efficiently by a local claims office. Your Kentucky Farm Bureau insurance also provides limited coverage for fire department service charges for your property. 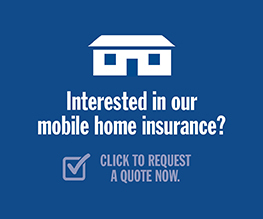 If you find it necessary to move your mobile home to protect it from damage by fire or another covered peril, we provide limited coverage for the cost of the move. Based on the age of your mobile home, you may be eligible for a discounted premium.